PHOTO BY GEREMY BORDONARO/GLEANER NEWS: Fans of the Victory Café, which will soon close to make way for the Mirvish Village development, need not despair. 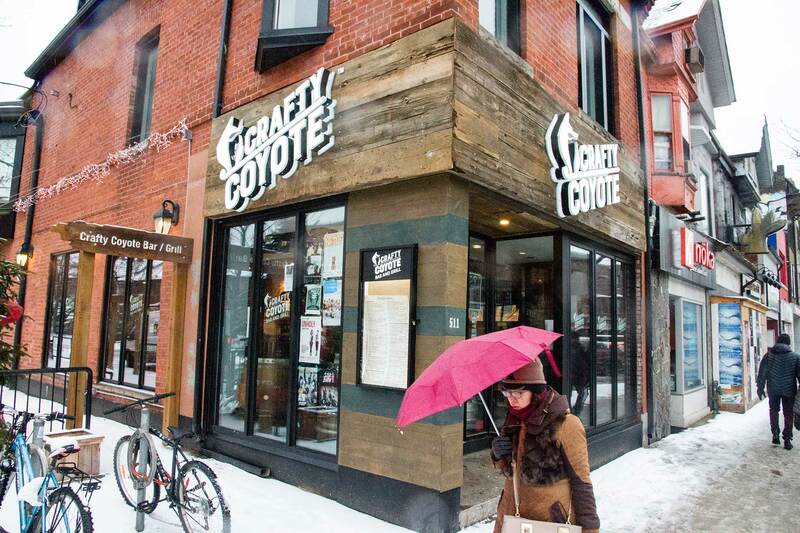 Owner Nick Ndreka has opened the Crafty Coyote on Bloor Street West. The bar boasts the same selection of craft beer and rustic atmosphere, and emphasizes its location with a sign emblazoned with the words The Annex. Founded over 15 years ago, The Vic, as the Victory Café is known to its patrons, will soon close. Like all businesses on Markham Street from Lennox to Bloor streets, it is making way for the Mirvish Village redevelopment. But local lovers of craft beer need not despair: owner Nick Ndreka is opening Crafty Coyote, a new bar at 511 Bloor St. W.
The concept is simple. Present a large selection of craft beer and let them stand out. Most craft drinkers look for a different beer every time and a large rotating tap will easily satiate even the most tenured craft beer drinker. As for the neighbourhood, the Annex provides a perfect demographic of patrons for a bar like the Crafty Coyote. Unfortunately, operations have not been without their twists and turns as the aforementioned patio was previously rejected by the community when the city conducted a poll of neighbouring residents who were concerned that Crafty Coyote’s east face on Borden Street would lead to late night noise during the summer hours. Though the patio request was initially denied by the community, Sinclair doesn’t believe that this means that the community will reject it again. He characterizes the community as being involved with the businesses and downtown hustle of the surrounding areas. This sentiment is echoed by Joe Cressy (Ward 20, Trinity-Spadina), who believes striking the right compromise is key. Though this hiccup may slow down the Crafty Coyote slightly, Ndreka is still optimistic about the bar’s future.